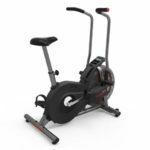 Although the AD2 is the oldest Airdyne model, it still remains one of the highly regarded fitness machines from Schwinn. It doesn’t offer a wide array of features such as the Airdyne Pro and comes with a rather basic console, but on the other hand, it’s an affordable and well-made bike, perfect for HIIT exercises. In terms of specs and frame construction, the Schwinn Airdyne AD 2 is comparable to the Marcy Air 1. It’s a rather small fitness machine, its fully assembled frame being only 46″ (117 cm) long, and 25″ (64 cm) wide. Its highest point is given by the handlebars, which reach approx. 50″ (127 cm) above floor level. These being said, the bike doesn’t take wide usage and storage area. However, Schwinn does recommend to allow at least two feet of clearance all around it, for ease of access and safe operation. The bike’s frame is made of durable steel tubing. All the steel parts in the frame construction are double coated with a corrosion-resistant paint. The color used for this particular model is gray, with the Schwinn logo painted red. However, there’s also a white/red version. Although the Schwinn AD2 Airdyne isn’t a large upright bike, it still has an impressive weight. With the frame fully assembled, it weighs 96 lbs (44 kg). It has a low center of gravity and both its bases are equipped with adjustable levelers. These being said, the bike offers an excellent stability; it won’t rock or move during the most intense workouts. Like most other air bikes, the AD2 does not have a folding frame. However, its front base is equipped with transport wheels. Thus, moving the bike to a storage location, once you have finished your workout, shouldn’t be a problem for anyone. 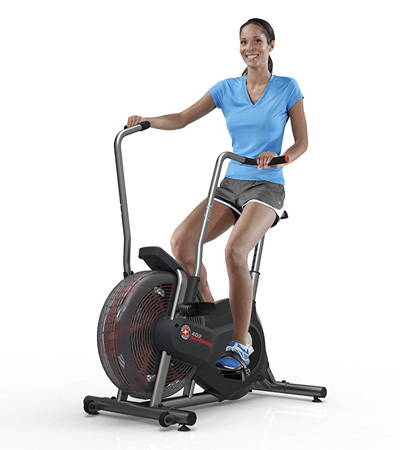 The Schwinn AD2 Airdyne features a standard, 2-way adjustable seat. The saddle is made of high-density foam; it’s not extremely comfortable, especially for heavier users. However, the attachment point to the upright post is a standard, triangular plate, so you can easily find a more comfortable replacement for it. A gel and/or sheepskin cover will also considerably improve its overall comfort. 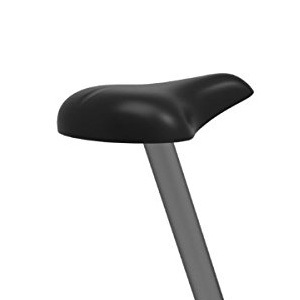 The seat’s upright post offers several adjustment positions. Unfortunately, there is no horizontal slider in order to adjust it closer or farther in relation to the handlebars, such as for the Sunny SF-B2706. It can accommodate users between 4’10” and 6’2″ (147 – 188 cm), providing a complete leg extension. It’s also rated for a weight capacity of 250 lbs (113.3 kg), but users up to 280 lbs (127 kg) have reported that the bike holds well even at weight loads of this caliber. The bike is equipped with two moving arms attached to the pulley. Thus, they continue to move for as long as the pedals are moving, or for as long as the flywheel is spinning. Their handles provide a standard horizontal grip, being covered by a layer of high-density foam, for maximum adherence and comfort. Also, the covers placed at their connection points to the flywheel axis are extended outward. Those extensions can serve as foot resting pegs, in case you only want to exercise by using the moving arms but not the pedals. 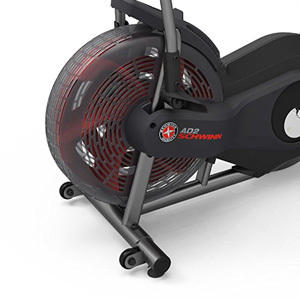 The Schwinn Airdyne AD2 features a large and thick ABS flywheel. The one equipped on this bike is slightly smaller than for other models. However, it still generates a pretty decent resistance. The fan is protected by two nylon guards. When in motion, it generates a soft air current which is directed at the user. Also, in case you’re wondering, the fan doesn’t generate a loud noise. Even if you pedal as fast as you can, the sound resulted is a fairly soft “woosh”. The bike’s resistance is solely generated by the flywheel-fan. There is no damper or any magnetic elements to give you the possibility to adjust the overall resistance. The only thing you’ll get is the dynamic response, specific to all fitness machine with air resistance. In other words, the faster you pedal and/or move the arms, the more resistance you will benefit from. 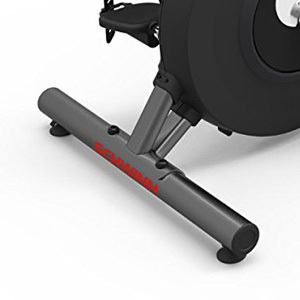 As a general idea, the resistance supplied by this exercise bike promotes light to medium workouts. The bike’s transmission consists of a poly-v drive belt. There are several advantages related to this type of drive. For example, it produces less vibration than a chain, it doesn’t require periodic lubrication, and you won’t have to deal with issues such as locked chain links. It’s also a very durable part, designed to last for many years of use. The crank, although a durable piece, it’s not made for standing up on the pedals. After all, this is an upright bike, not a spin bike. The crank arms are made of solid steel, with a chrome finish, while the pedals are weighted, featuring a metallic core and nylon shell. They have adjustable straps to secure your feet in place during your workout. One last aspect to mention here regards the bike’s Q-Factor (spacing between the pedals). Although the exact number isn’t specified, it’s fairly narrow. Thus, your feet will assume a correct position on the pedals, and the pedaling motion won’t generate any lateral stress. The Schwinn AD2 Airdyne features a console that offers a bit more than the average basic console. To begin with, it’s equipped with a large LCD display, and the values on it are shown in big digits, easy to read. It doesn’t have a pulse reading function, but does track time, distance, speed, RPM, and calories. It has a SCAN function that rotates all these metrics, showing each one for 5 seconds. The unit is a bit tricky to operate as it has only one button that covers several functions. For example, it has a Workout Mode and a Pause Mode. When in Pause Mode, you can select between English and metric units for the speed and distance, or view the total distance traveled and the total time spent pedaling. The button also covers the RESET function, and in order to clear all the values to zero, you have to press it and hold it for 3 seconds when in Workout Mode. The console unit also has a sleep mode feature. If it doesn’t receive any input from the flywheel in 5 minutes it will shut down automatically. It’s battery-powered and requires 2 AA (LR6) batteries, which are not included. The core of the bike comes pre-assembled. Therefore, all you have to do for assembly is attach the bike’s bases, the seat bar, the seat, the pedals, the console, and the moving arms. This shouldn’t take more than 30-40 minutes. The assembly instructions are very clearly illustrated in the included manual; also, a basic toolkit for assembly is included. For maintenance, you don’t have to worry about the internal parts. They come pre-lubricated, and shouldn’t require any additional lubrication for a long time. The fan may accumulate dust and should periodically be cleaned. It’s also recommended to periodically check its joints, bolts and nuts, in order to re-tighten them if its the case. Moisture (or perspiration) should be removed from the console. Excellent warranty and customer support from Schwinn. 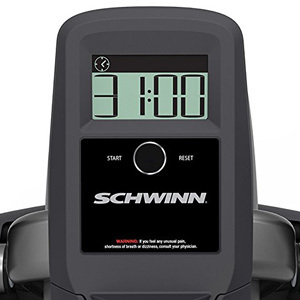 The Schwinn Airdyne AD2 is an air resistance upright exercise bike designed for home use. It features a sturdy frame, able to support users up to 250 lbs. It includes a fitness meter which can track time, speed, distance, RPM, and calories. It’s a bike designed for light to medium workouts, perfect for interval training, gaining stamina, recovery training and weight loss. It’s an affordable air bike, perfect for home use, and offers an excellent value for the price.